Featuring cast aluminum body and ergonomic composite rubber grip, Heavy Duty Safety Air Gun safely removes chips, dust, and other contaminants from products, machinery, and work surfaces. 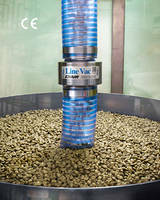 Unit uses 3/8 NPT compressed air inlet to maximize airflow available to Super Air Nozzle. 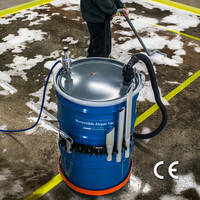 Airflow cannot be blocked, which complies with OSHA standards. Providing reach for areas not easily accessible, aluminum extension pipes are available in lengths up to 72 in. 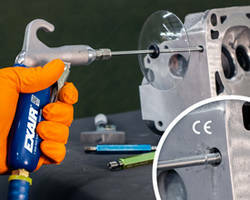 EXAIR's new Heavy Duty Safety Air Gun is a powerful air gun that safely removes chips, dust and other contaminants from products, machinery and work surfaces. The ergonomic composite rubber grip and wide curved trigger make it comfortable for hours of use without fatigue. It has a durable cast aluminum body that is ideal for rugged, industrial environments. 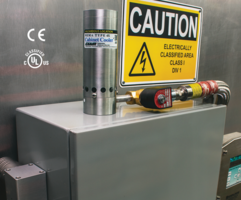 The Heavy Duty Safety Air Gun uses a larger 3/8 NPT compressed air inlet to increase the airflow available to the Super Air Nozzle, resulting in higher force and flow than ordinary air guns. The air exhausts from Super Air Nozzles that have been engineered to deliver the highest force at the lowest air consumption. A variety of Heavy Duty Safety Air Gun models use different engineered Super Air Nozzles, giving the user a choice of flow, air pattern and force that ranges from 13 ounces to 3.3 pounds. The sound level is quiet and the airflow cannot be blocked, which complies with OSHA standards 29 CFR 1910.95(a) and 1910.242(b). 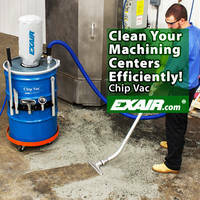 Applications include parts cleaning, chip removal, part drying, part ejection, and liquid blowoff. Aluminum extension pipes to provide "reach" for areas not easily accessible are available in lengths up to 72". Prices start at $72.